Bond wears his second black tie outfit in The Living Daylights on a date/mission to the opera and amusement park in Vienna, Austria. 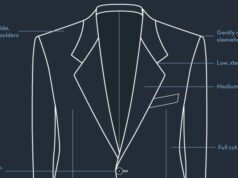 The black dinner suit has a notched lapel jacket with a one-button front, four-button cuffs, jetted pockets and lapels, all satin-trimmed. The jacket is cut with double vents. Like with most of the suits in The Living Daylights, the shoulders of this jacket are heavily padded and the fit is slightly too large. Some may argue that a dinner suit should not have notch lapels, but when wearing a dinner suit to an amusement park the more casual lapels don’t seem so out of place. However, more formal peak lapels would have been better suited for the opera. The dinner suit’s trousers have double reverse pleats, wide tapered legs and are worn with white clip-on braces. Whilst they are okay for kids, clip-on braces have no place in the wardrobe of a well-dressed man. Braces should button onto the waistband of the trousers. Bond wears no traditional waist covering, a poor choice considering he reveals the clips of his braces when his jacket is open. James Bond wears a white shirt with a spread collar, double cuffs and pleated front. The narrower pleats found on Bond’s shirt were more popular at the time than the more traditional wider pleats that Bond had worn in previous films but the shirt is still from an English shirtmaker. The shirt has mother of pearl buttons down the placket, which is stitched 3/8 inch from the edge in the traditional English fashion. Bond’s bow tie is black satin silk in a narrow thistle shape. Bond’s shoes are black patent leather plain-toe slip-ons with a full black grosgrain strap over the vamp. 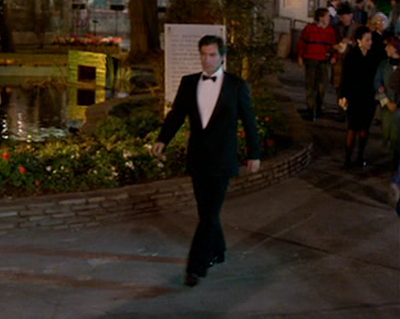 Whilst the outfit is better than the notched-lapel dinner suit in Licence to Kill, it still needs some improvement. It's not perfect and I prefer the shawl-lapel suit he wears in Bratislava, but as you say it's much better than Licence to Kill. In fact just about everything about this film looks better than Licence to Kill! I'm not a Dalton hater but he does not have the polished style of Moore or Brosnan (few do.) Particularly objectionable is his hairstyle in Licence to Kill, I'm not sure who's idea that was but it looks terrible. I agree with anonymous. Overall, the description "mediocre" sums Dalton's appearance/style in this movie whilst in the next any variation on "appalling" about fits! Is it ok to wear both braces and cummerbund? No Bond, except Dalton in Licence, have done it before. I think..
Anon2, yes it is perfectly acceptable. A cummerbund serves the same purpose as a waistcoat, to cover the waist, whilst braces hold up your trousers. A cummerbund is not by any means a belt. Dalton is wearing clothes with a slight Eighties look. He looks fine. It's a shame that other actors on this blog get a free pass for hideous Seventies clothes and the same generosity is never applied to Dalton. Thankfully he looks like a realistic character wearing his own clothes not a tailor's dummy. He doesn't act like one either. The issue here isn't 70's fashions vs. 80's fashions – it is FIT. A discerning gentleman knows when clothes fit and when they don't. Reportedly Dalton had to buy a suit for his first 007 press conference because he DIDN"T OWN A SUIT! Mind you, we are talking about a man in his late 30's. No wonder he looked ill-at-ease and couldn't tell that his sleeves were too long or his shoulders were too padded once they put him in a suit. Moore's most extravagant 70's outfits, on the other hand, still fit him perfectly even if the lapels were too wide or the pants too flared by contemporary standards. Look at the back of the jacket of the elephant gray suit in Moonraker – a level of sartorial perfection that I would consider unattainable today. Excellent point Dan. I didn't know Dalton did not own a suit before Bond. 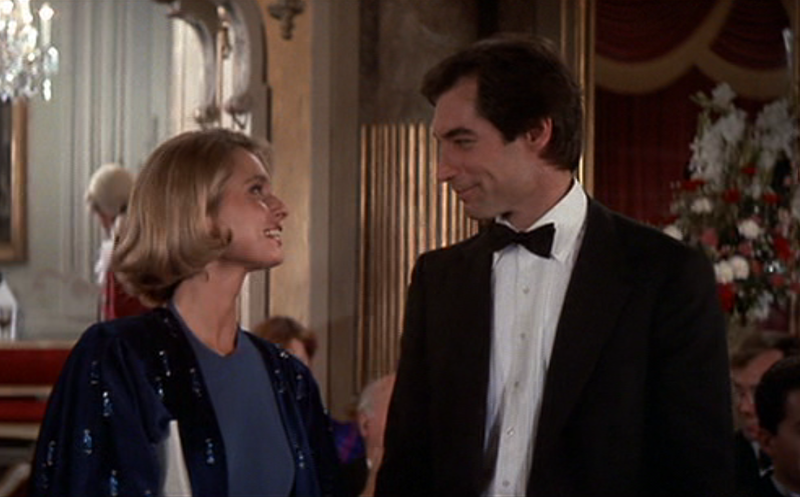 The only suit that really is terrible on all counts is the dinner suit in Licence to Kill. The only thing that could've made it worse would have been a wing collar. The only good thing about that outfit is the cummerbund. This one here isn't so bad, though I pointed out the good and bad already. the point of 80's styling is that the fit was oversized. Its not ill-fitting its deliberately oversized. Look at the car coats worn by Simon Dutton's Saint, the clothes worn by Christian Burgess in Saracen ( playing an Irish Guards Major) or Charles Dance in The Secret Servant as an SAS Major working at 10 Downing St. They're all equally deliberately over-sized. As for the hoary old chestnut that Dalton had never owned a suit..complete nonsense. Not only did Dalton keep all the clothes from Brenda Starr which he was filming until 48 hours before filming of TLD began he attended a press photocall for his stage show with Vanessa Redgrave wearing a dark blue suit, as well as the numerous suits he'd had from tv and theatre. 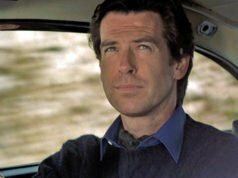 Barbara Broccoli bought him an Armani suit on the way to the press call for The Living Daylights because he didn't have a suit in his luggage that Barbara considered trendy enough. The idea that he can't tell if his sleeves are too long is just a cheap insult. What is wrong with a wing collar? Following trends is no excuse for dressing poorly. The suits in The Living Daylights have the big shoulders that were popular at the time but not much else looks outdated style-wise. Though a larger fit can still be well-tailored, Dalton's suits in The Living Daylights were a little sloppy. 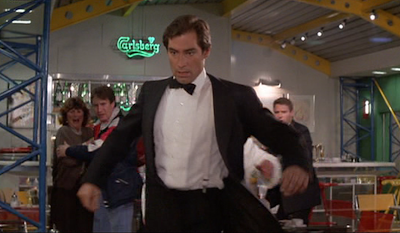 The fit and style in Licence to Kill was taken to the extreme. For some great examples of well-tailored 80's suits watch the fourth season of Remington Steele. The suits had a loose fit with large shoulders and had a style reflective of the time, but they were still well-tailored with clean lines. 80's style was big and loose, but it did not have to be sloppy. 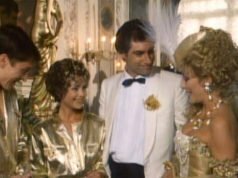 Most of the Bond's have worn clothes influenced by current trends but Dalton in Licence to Kill took it further than any other Bond has. You might argue that Roger Moore took current fashions just as far, but at least he didn't wear leisure suits. And his clothes had a lot of individuality whilst Dalton's were just standard off the peg suits. That might be more appropriate for the character, but it doesn't make him any better dressed. The focus of this blog is more about clothing than the James Bond character. A wing collar with black tie has been outdated since the 1940s, at least in England. It's a formal element of white tie that looks out of place and slightly tacky with the less formal dinner jacket. While a white bow tie blends in with the white collar, a black bow tie stands out and can look sloppy. It's especially unattractive if the bow tie is adjustable with a clasp in back. A proper wing collar is detachable and the shirt has a starched front. It should never have a pleated front. A wing collar also requires the formality of a waistcoat, not a cummerbund. I just feel bad because Dalton can't catch a break. He got, I think we can all agree, some of the worst Bond stories. Everybody wanted Brosnan in the role at the time. And, apparently — we can blame wardrobe for this, right? — his clothing was bad, even for the era. Wrong Bond for the time. Imagine, if you will, Brosnan was free of Remington Steele and Dalton didn't come along until the Berlin Wall fell. He was the haunted, haggard, lost cold warrior. I digress. Bram, I thought The Living Daylights was a great film and had a great story. The clothes were okay in The Living Daylights, but the clothing has nothing to do with Dalton's acting ability and the films he made. Living Daylights was a great opening, and I think I just stopped taking it seriously after they skidded across the border in the cello case. IIRC, that opening was derived from the short story — maybe the last of any adaptation of Fleming? I could go on and on about Dalton. Someday I'll get to NY and we'll go over my Bond Hypothesis in excruciating detail. Though, seriously, how much input do the actors have, and how much does the studio/wardrobe department have in costuming a character? Bond wears braces with his dinner jacket in Casino Royale, I believe. The only actor who probably had input in his clothing for the Bond films was Roger Moore. He used his own tailor and was very much into his clothing. But I'm sure someone toned down his own tastes to be more in line with Bond's. Director Terence Young was responsible for Bond's look in his films and Peter Hunt was responsible for the clothes in On Her Majesty's Secret Service. Timothy Dalton reportedly talked cosutme designer Jodie Tillen out of putting Bond in pastel suits. Costume design Lindy Hemming was responsible for Bond's clothing in her films, but I know for Casino Royale she considered Daniel Craig's opinions on some of the clothing. Louise Frogley in Quantum of Solace also respects Daniel Criag's fashion sense, but I don't if she consulted him. Is it acceptable to wear a dinner jacket without silk facings? Without silk facings it is a black suit. And a black suit should not be worn like a dinner jacket. However, a white dinner jacket should not have silk facings. Not too bad, but not as good as the one he wore to the Bratislava concert/mission. Considering, though, that Bond and Kara have just escaped Czechoslovakia with nothing but the clothes on their backs (and a cello…), it would seem that Bond must have got his black-tie outfit here from the same place as he got the tickets for the opera: from the local offices of "Universal Exports". My guess would be that an outfit with a notch lapel dinner jacket and clip-on braces were all the local station could rustle up at such short notice for Mr Bond. Dalton_Fan, considering Dalton wore clip-on braces in Bratislava as well, he didn't seem to have a problem with them. Didn't Dalton wear proper buton-on braces with the much-maligned LTK tuxedo? Correct, he did wear proper braces in Licence to Kill. The braces and cummerbund were 2 very admirable aspects of that outfit. First of all blame regarding the fit and the style choices, blame the costume designer, not the actor. Secondly, one may notice throughout his career that the actor in question simply does not carry clothes particularly well in the “clotheshorse” sense. I suspect that it was hard to fit him well and still have him be comfortable enough for whatever action he had to perform. However, he looks very natural and comfortable and the clothes do not wear HIM, which is also a good thing. Because the movies are not really about clothes after all. I agree that there is no reason to bash Dalton. But this blog is about the clothing, not about the movies, and any criticism of the clothing of valid. Could a more casual dinner jacket like this one be worn with a neck tie as informal? No. A long necktie should never be worn with a dinner jacket of any sort. Only a black bow tie should ever be worn with a dinner jacket.